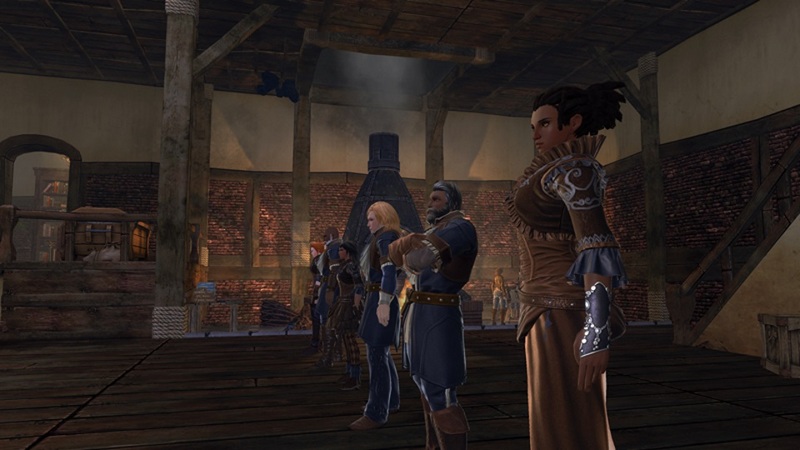 The team at Cryptic has been dropping big news this week about upcoming changes to Neverwinter, when the Heart of Fire Module launches on November 6th. The update will see the complete replacement of the existing Professions (read: crafting) system and a retooling of dungeon rewards – including the removal of the Salvage mechanic and dungeon keys. The first article this week, from Systems Designer Doug “Asterdahl” Miller, details the new Professions Workshop location that will taken over from the primarily UI-based Professions system. The professions overhaul is a ground-up redesign of the entire professions system including entirely new recipes, a personal workshop, over 200 unique artisans to hire, and big changes to how recipes themselves are completed. Today I want to talk a little about the workshop itself, your new in-world base of operations for all things professions. The workshop is slated to be a physical location in the Protector’s Enclave hub, but will have options for remote management once your profession skills are high enough. One of the major new features includes the ability to have artisans continue to perform tasks on repeat, reducing the need to check in every 4-12 hours as exists in the current iteration of the system. A second article from Jared “NoWorries” Sears on the official forums, details the upcoming changes to dungeons, which involves unhooking Astral Diamond rewards from equipment (and the removing of Salvaging as a mechanic). By separating the RAD rewards from equipment rewards, it will allow us to continue to be able to make equipment affordable, to be given out as a catch up, and to drop more regularly while also being able to hand out RAD rewards for a wide variety of content (There will still be rare chase items that are not easy to acquire). Dungeon end chests will now reward RAD directly along with their equipment rewards. The seal store, campaign stores, tradebar store and stronghold equipment store will all have RAD for sale for their respective currencies. Heroic Encounters will also award RAD on completion. Existing sources of direct RAD such as experience overflow rewards and certain weekly quests will continue to reward RAD as they have previously. In the second part of the changes details, Sears reveals that dungeon chest keys are getting drastically scaled back, with Standard, Epic and Daily keys being removed completely. Starting in M15, non-legendary end chests will be able to be opened for free. This means for most queued content players will get a chest to open on every run without needing to have keys in their inventory. On top of this, the chest loot for both standard and legendary chests can now be rerolled for a small amount of AD (currently 5,000 AD but as with anything, things are subject to change). The forum thread has a number of responses from Sears that address what is happening to Salvage-related resources (such as anvils turning into Seals merchants), along with epic key rewards being swapped out for reward reroll tokens.